Provo • Merril Hoge carved out a fine career in the NFL as a running back before moving on to the television studio as a longtime analyst for ESPN. But the eight-year NFL veteran with the Pittsburgh Steelers and Chicago Bears is not happy that his son, Beau, has been moved from quarterback to running back by the BYU football staff. In an interview with BYUtv’s BYU SportsNation television show Wednesday, Hoge used words such as stupid, weird, bizarre, smelly and dumb to describe the switch, which was made last spring but only came to light when preseason training camp opened on Aug. 2. The NFL analyst, who was laid off by ESPN in April 2017, saved his biggest criticism for BYU assistant head coach Ed Lamb, who apparently first approached Beau Hoge about moving to running back. Hoge refers to Lamb as the “linebackers coach” in the interview, which Lamb is, but did not mention that he also serves as the assistant head coach and special teams coordinator. Wednesday evening, Beau Hoge posted a statement on Twitter. It read: “This morning my dad expressed frustrations with my switch to running back in a media interview. My dad is the best father in the world and believes in me, but I am at peace with moving to running back and excited to help our team in any way I can. "I haven’t always shared all of my feelings about this with my dad, and that’s my fault. My concerns and questions about playing another position were always answered by my coaches in meetings that lasted as long as they needed to be in order for me to feel at peace about moving positions. A few days before camp opened, Lamb spoke to an alumni group in Cedar City and had high praise for Critchlow, who he recruited to Southern Utah when he was the head coach there. Critchlow followed Lamb to BYU when he returned home from a church mission. However, earlier this week BYU coaches announced that the final two candidates for the starting quarterback position that Hoge and Critchlow desired are senior Tanner Mangum and freshman Zach Wilson. Merril Hoge said he thought is son was “messing with me” when he first told his father the coaches wanted him to move to running back. “Well, that’s stupid,” was Merril Hoge’s initial reaction. Interviewed the day camp opened, Beau Hoge said he was willing to do anything to help the team and did not express disappointment or anger in being moved to running back. 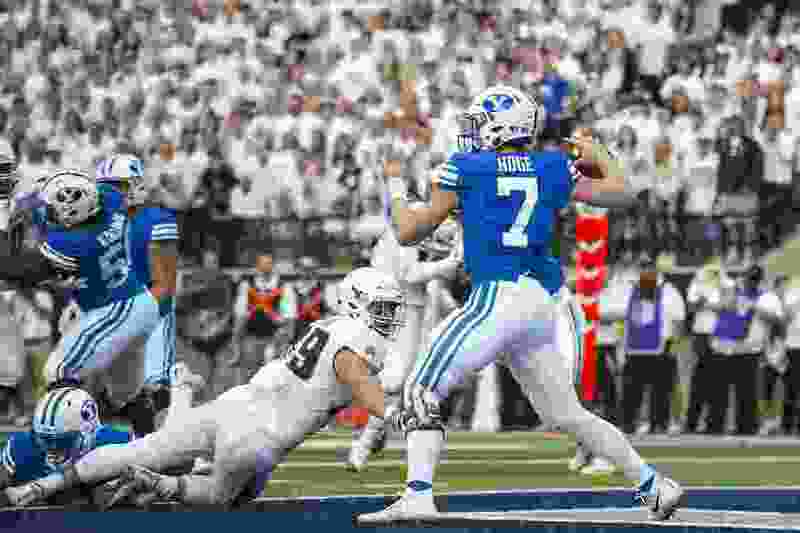 Beau Hoge approached BYU coaches in the summer with his desire to remain a quarterback, but the request “fell on deaf ears,” according to Merril Hoge. Asked if BYU coaches might want to use Beau Hoge in a wildcat role or an inside-the-20 specialist, Merrill Hoge allowed that it has been discussed. Merril Hoge said he attended Saturday’s scrimmage and watched Beau Hoge play well at running back, but the performance did not change his mind. He compared BYU’s playbook to a Little League playbook they used when Beau was 12 years old. “I don’t like gadget offenses,” he said.